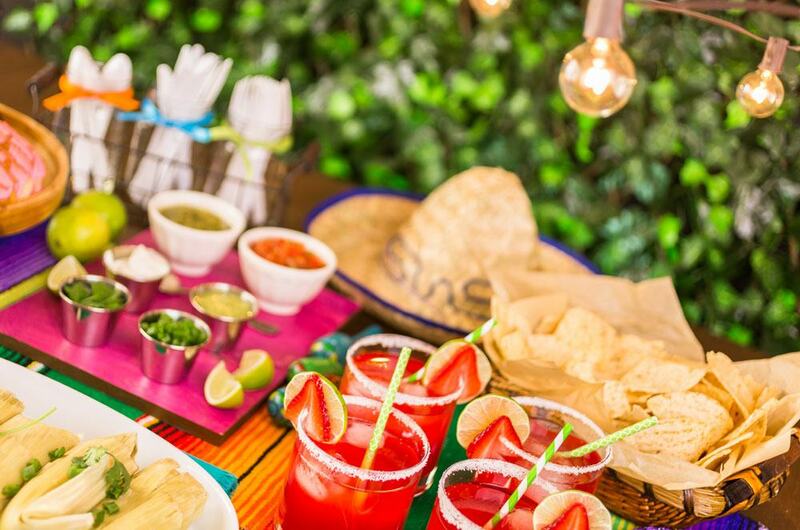 Turn up the mariachi music and shake up some refreshing margaritas because Cinco de Mayo is almost here! Whether you’re throwing a large fiesta with friends or looking for a few tasty appetizers for a small family celebration, these Mexican finger foods are the perfect addition to any festive table setting. From a fun twist on the classic taco to a colorful vegetarian Mexican appetizer, there’s something sure to please everybody. The best part? These simple recipes feature easy-to-find ingredients, all of which can be purchased at your nearest Foodtown grocery store. It certainly isn’t a fiesta without a taco. Here’s a fun twist on this classic Mexican dish: crunchy taco cups! Easy to make and loved by kids and adults alike, they’re the perfect addition to any Cinco de Mayo celebration. Preheat your oven to 375°F. While preheating, coat a standard size muffin tin with nonstick cooking spray. Combine browned ground beef, taco seasoning, and diced tomatoes in a medium sized bowl. Line greased muffin tin with wonton wrappers (one wrapper per muffin cup) and spoon 1 ½ tablespoons of the taco mixture to each cup. Top each with 1 tablespoon of cheese. Add another layer of wonton wrappers and press down. Add another layer of taco mixture and a final layer of cheese. Bake for 11-13 minutes or until cheese is melted and wonton edges are golden brown. Classic potato chips get a fancy upgrade in this simple and delicious appetizer. Your guests will love the flavors and textures—the crunchy chip pairs perfectly with firm shrimp while the spice of chili powder and the coolness of guacamole create a harmonious flavor combination. Place olive oil in a large pan over high heat. While warming, sprinkle chili powder over top of the shrimps and toss to coat. Add shrimps to pan. Cook for about 2-3 minutes, turning over halfway through until shrimps become pink and opaque. Arrange 18 chips in a single layer on a platter. Spoon about 2 teaspoons of guacamole onto each chip and place a single shrimp on top. These pinwheels are so festive, you’d never guess they’re so easy to make! They’re even better when made ahead of time, giving the flavors a chance to meld together while giving you more time to celebrate! Thoroughly mix cream cheese, shredded cheese, and chili powder in a medium bowl. Divide cream cheese mixture evenly onto each of the four tortillas and spread over entire surface. Sprinkle ¼ cup of black beans and ¼ cup of bell peppers onto each tortilla. Roll tortillas tightly. If needed, add a small amount of cream cheese mixture to “glue” the ends of the tortilla closed. Slice tortilla rolls crosswise into about ½ inch thick pinwheels. Sprinkle cilantro over top to garnish and enjoy immediately. *Pinwheels can be stored in the refrigerator for up to 8 hours prior to serving. We bet you’ve never realized just how easy it is to make those frozen taquitos you love! This simple protein-packed appetizer is the perfect addition to your fiesta and is sure to impress your guests. Pour oil into a small sauce pan until the surface is covered by about ½ inch. Heat over medium heat. Mix chicken, cream cheese, sour cream, salsa, Colby jack cheese, and spinach in a large bowl. Add salt and pepper to taste. Once oil is hot, add a few tablespoons of the chicken and cheese mixture to the center of each corn tortilla and spread evenly. Roll up tightly and using tongs, set rolls in the oil one at a time, seam-side down. Cook until golden brown, turning once to cook both sides. As each taquito is finished cooking, set on paper towels to drain excess oil. Who knew that throwing a Cinco de Mayo fiesta could be so easy? Find everything you need for these tasty Mexican finger foods at your nearest Foodtown grocery store. In addition to a more convenient shopping experience, you’ll find family-friendly prices on each and every ingredient. That means more time celebrating and less time stressing! Shop online or visit your local Foodtown supermarket to prepare for your upcoming Cinco de Mayo celebration. Plus, don’t miss out on the savings found within our weekly supermarket circular and digital coupons.